Do you like quirky girls? Are you, perhaps, a quirky girl yourself? 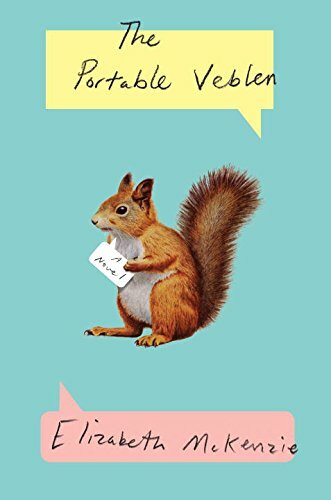 Then you will love The Portable Veblen, a novel about special snowflake Veblen (named for a sorta-famous dead white guy), who works as a secretary (but moonlights as a Norwegian translator), loves squirrels (maybe a little too much), and is newly engaged to Paul (a medical researcher and inventor who believes himself to be on the cusp of greatness). Veblen has a lot of questions and ambivalence about her life. Her mother is a handwringing hypochondriac and narcissist who demands careful handling at all times to avoid meltdowns. Then there's her mentally ill father, whom she was forced to visit every year as a child until he finally acted out enough to end Veblen's court-appointed torture. It's clear that Veblen has always been the one who holds it together amid her family's instability. And she also has doubts about her future with Paul. Veblen isn't convinced getting married is the right thing to do—and I couldn't blame her for that, considering the ridiculous example of her parents. Paul is mostly steady and competent, but when a mammoth-sized pharmaceutical company decides to license and manufacture a medical device he invented, he gets sucked down a corrupt corporate rabbit hole from which there is no easy escape. Oh—and Paul comes with his own familial baggage, having been raised in the shadow of a disabled brother by pot-cultivating hippies. That's more summary than I wanted to provide here, but as you can plainly see, there's a lot going on in this novel, and I want you to know what you're getting into should you choose to pick it up. Veblen and her story are weird enough that they won't appeal to everyone. However, I found her sweet and relatable and was pulling for her from the beginning. (A woman working as a secretary by day and pouring herself into a passion project in her free time? Uh, yes. The fact that Veblen's passion project is translating from Norwegian and not reading books for fun was immaterial.) And Paul's predicament with the pharmaceutical company, though it didn't grab me at first, grows increasingly absurd and ends with a hilarious bang. This is the book to buy for your kooky aunt. Or for yourself if, like me, you are somebody's kooky aunt. With regards to Penguin and NetGalley for the advance copy. On sale 19 January 2016.